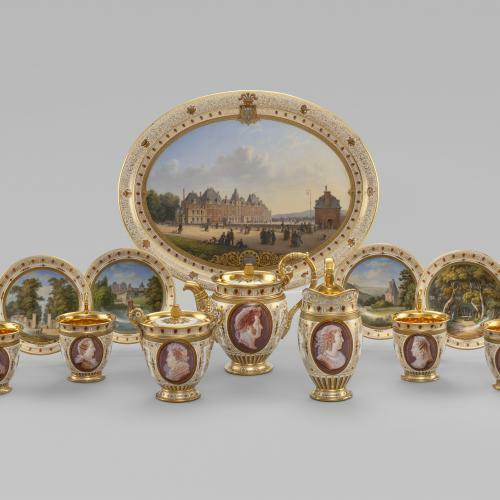 In 1756, the French porcelain manufactory Vincennes was transferred to larger quarters at Sèvres, a town on the other side of Paris, and shortly afterwards was bought by Louis XV at the request of his mistress, Madame de Pompadour. Despite royal patronage, the manufactory was greatly affected by the upheavals of the French Revolution. The appointment of Alexandre Brongniart as the Director of the factory in 1800 marked the beginning of a glorious era for Sèvres, as his management completely reversed the factory’s precarious financial state. Trained as both a scientist and engineer, Brongniart influenced every aspect of the manufactory’s organisation and production, and often designed the shapes and patterns made at the factory. 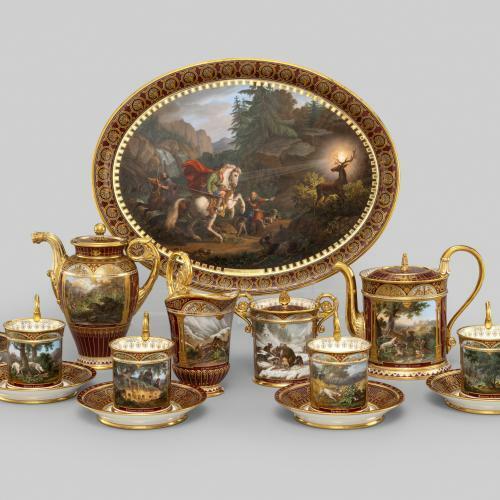 He was able to sell off Sèvres’ old and outdated surplus stock, while creating fashionable Neoclassical models with new enamel colours, lavish gilding and intricately painted decoration, which were greatly admired by members of European nobility. This teapot is described in the factory’s records as Théière étrusque gaudronnée (‘Etruscan gadrooned teapot’), which was first recorded in 1813. The Neoclassical shape and heavy gilding reflect Brongniart’s preference for ancient Greek and Roman forms. The teapot once formed part of a tea service which was sold in 1820 to the Baron d’Estouches from one of the Sèvres showrooms. The Baron was at this time Prefect of the Seine-et-Oise region in Northern France.